The posts have been planted in holes filled with concrete. 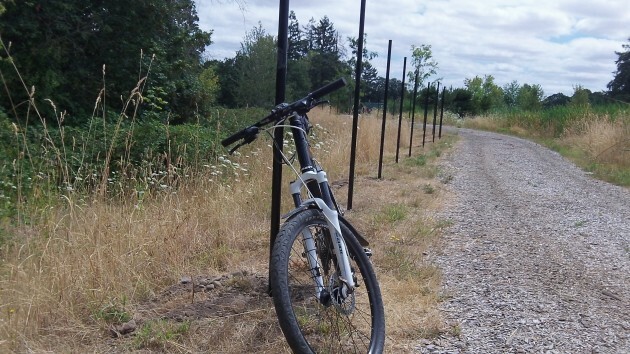 The fencing of America continues, this time at the Talking Water Gardens of Albany and Millersburg near the Willamette River. Why, you ask. Because they said so. The “they” in this case is the Oregon Department of Environmental Quality. On a bike ride, I noticed the fence under construction for about a quarter of a mile along the northeastern perimeter of the 39-acre engineered wetlands that opened in June 2012. There’s nothing on the outside of the perimeter path other than a vast tangle of blackberry vines and then First Lake. So why a fence? Because it’s required under the funding agreement with the Department of Environmental Quality that helped pay for this project, I learned from Chris Bailey, the city of Albany’s interim public works operations director. The $13 million Water Gardens were partly paid for with $8 million in grants and loans, including federal stimulus money, funneled through the state DEQ. Bailey told me that part of the deal with the DEQ was that a fence be installed to secure the facility in case securing it — keeping people out, that is — should ever become necessary. She couldn’t think of an example of such a dire emergency in this system of paths, ponds, weirs and waterfalls, and neither could I. She did mention that some time back, somebody reported a “suspicious device,” and they had to station guards on various points to keep people out while the bomb squad determined it was a harmless geocache. Hi Hasso, I too dislike the fencing of public sites. My personal pet peeve is the fencing of school playgrounds. Jefferson Elementary school in particular. Back when I was in junior high school back in the 70’s, I made a lot of money selling night crawlers. 25 cents a dozen, and wooden sign in my yard, and I could sell as many as I could collect. I made plenty of money, to go to the movies, out to eat, or whatever else a kid in grades 7-9 could want. My hunting grounds: The large playground at Jefferson Elementary school. I’d be out there with my flashlight and a large can on a string around my neck, after dark on most summer nights tip 11:00 or so collecting night crawlers to sell the next day. The playground was awesome hunting grounds due to all the grass, and the fact that the school kept it watered in the summer, which brought out the worms. But today — it’s locked up, off limits. At least that’s what it looks like when I drive by. Perhaps local kids still know how to get through the fence after hours. Well gee Tom, I guess you want it all paid locally. Fair enough. Of course the water/sewer bills will have to increase, raise an additional $8 million plus the interest costs since an additional bond would probably have to be issued. On the other hand, the federal/state funding that is available for this project is done so that local costs are held down with protections to the Willamette that helps protect folks/uses downstream and the fish stocks in the river. The idea is that lots of people benefit, and while the locals pay a big chunk, others can chip in too. In this case reducing the temperature of the outflow, which warmed the Willamette temperature, was a prime reason for the process. Given the massive die-off of salmon this summer in Oregon rivers that is occurring due to high water temperatures, the wisdom of this approach is clear. Having to cough up $50k for a fence that really isn’t needed is irritating. My recollection is that after 9/11 fencing public facilities became a requirement in our country, as the fencing of the old Bureau of Mines occurred too. Was that all an overreaction to fears of terrorism? I think so. Yet the public was in massive support at the time. In any case, Talking Water Gardens is performing a vital role and has become a great community asset. It would be a shame to have not done it because some folks are philosophically opposed to getting $8 million chipped in simply because of things like this fence. With your expertise in this matter, please tell us what Wah Chang and Millersburg, our “partners” in this project, are contributing toward this fence?